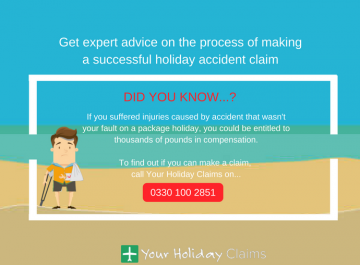 If your package holiday was ruined by campylobacter, the experts at YourHolidayClaims can help you. 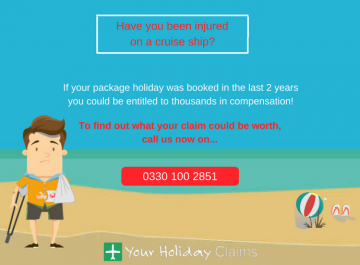 As long as your holiday took place in the last 3 years, you could be entitled to claim thousands of pounds in compensation, no win no fee. 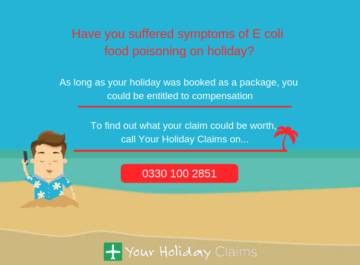 At YourHolidayClaims, our specialist team of solicitors are experts in helping clients receive compensation after suffering campylobacter food poisoning on holiday. 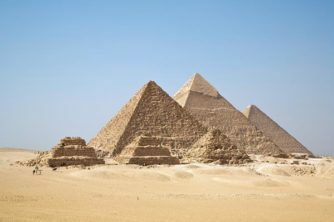 If you’ve suffered an illness caused by campylobacter food poisoning which lasted for more than 7 days, you could be entitled to compensation from your tour operator. Our dedicated team will work for you to help you receive the compensation you deserve for the illness you suffered, the loss of enjoyment of your holiday and any other financial losses your illness has caused. 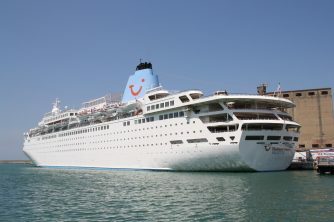 To talk to one of our expert holiday claims advisers about how we can help you, call us today on 0330 100 2851. 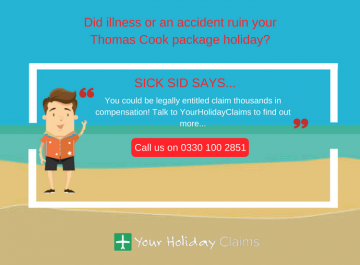 Or, you can arrange a call back with a member of our team by starting your holiday illness claim online. Do you have a right to make a campylobacter compensation claim? 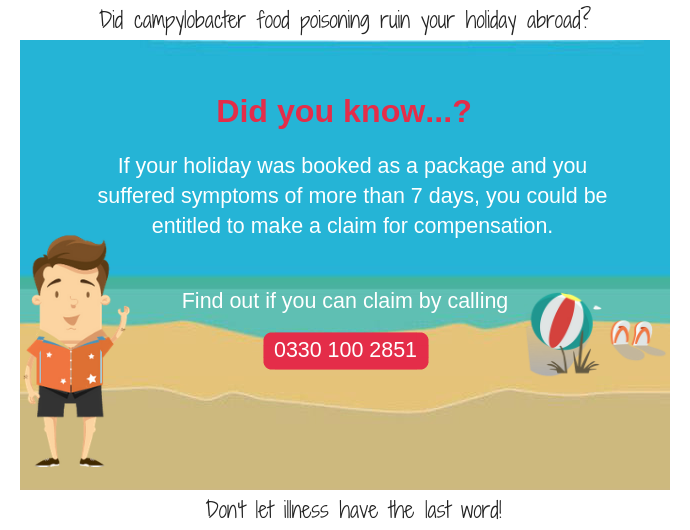 If you have suffered an illness on holiday caused by campylobacter food poisoning, the specialist team at YourHolidayClaims can quickly advise you on whether you may be entitled to make a claim. Was you holiday within the last 3 years? 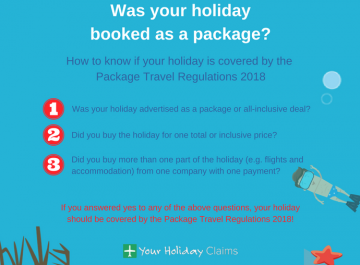 Did you book your holiday as a package? Did the illness symptoms last for longer than 7 days? Did you only consume food at the hotel prior to your illness? Did you receive medical attention on holiday or after your return home? Was your illness reported to your tour operator? 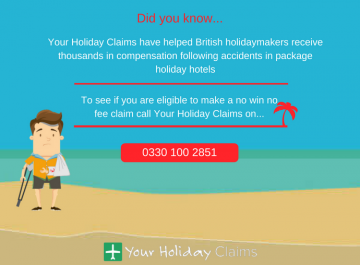 Here at YourHolidayClaims, we handle all campylobacter holiday claims on a no win no fee basis. This means that you can have peace of mind knowing that in the event your claim is unsuccessful, you will pay nothing at all (provided that you comply with Your Responsibilities under the terms of our Conditional Fee Agreement). 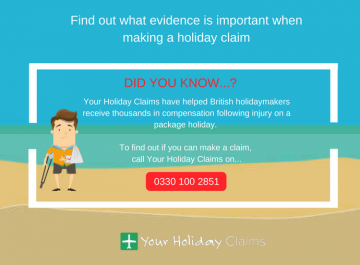 Starting your holiday illness claim with the team at YourHolidayClaims is simple. 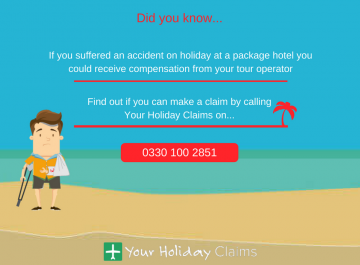 All you need to do is give our specialist holiday claims advisers a call. Our dedicated team will discuss the circumstances of your case and gather information to determine whether you have a strong claim. 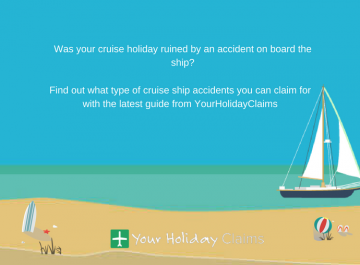 If we take on the case, the experienced solicitors at YourHolidayClaims will handle the claim and deal directly with your tour operators on your behalf to help you receive the best possible outcome for your claim. 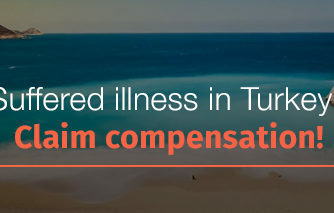 To discover whether you are entitled to receive compensation for your holiday illness, call us today on 0330 100 2851. Or, if you’d prefer to receive a call back from a member of our team, you can start your holiday illness claim here.